In the research line ‘Synthesis Gas’, model substances will be selected to produce high-quality intermediate chemicals within an economically feasible reaction cascade. This will make the chemical industry more sustainable and allow for the use of other feedstocks. 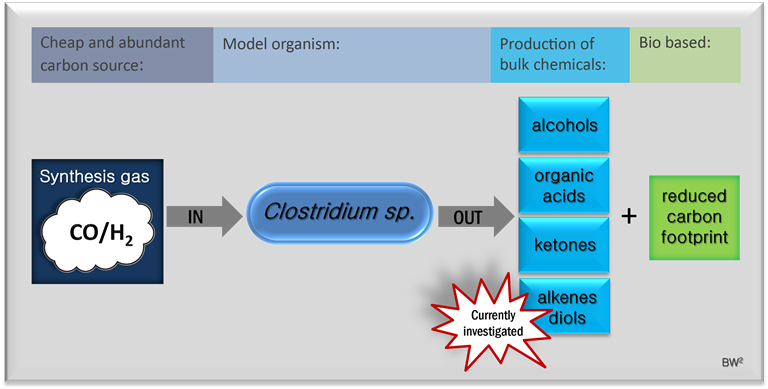 In order to produce these target chemicals directly, genes of interest are expressed in recombinant clostridia resulting in modified products. For example, the expression of P450-monooxygenases and dehydratases in Clostridium sp. can be used to generate a multifunctional production unit. Metabolic pathways for the synthesis of organic acids (propionate, acetate, butyrate) and ketones and alcohols (acetone, ethanol, isopropanol, butanol) are known and, in case of acetone and butanol, also successfully heterologously expressed in acetogenic clostridia. Another genetic modification for the formation of caproate and hexanol, through the expression of the corresponding Clostridium kluyveri pathway and aldehyde ferredoxin oxidoreductase and aldehyde/alcohol dehydrogenases, is investigated in this research line. In combination with cytochrome P450 monooxygenases this should facilitate the formation of diols such as ethylene glycol, 1,4 –butanediol, and 1,6-hexanediol. By hydroxylation and water removal using cytochrome P450 monooxygenases and dehydratases, important unsaturated compounds such as propene or 1,4- butadiene can be produced.